Hills and the SPCA have had many dog shows. Contact Hills or the nearest SPCA to volunteer. Sadie, a gorgeous German Shepherd cross owned by a very proud Boy Nxele, won Best on Show at the fourth annual Hill’s Township Dog Show, recently held in Lidgetton, KwaZulu-Natal, South Africa. Unlike traditional shows where the entrants arrive ready groomed, at the Hill’s Township Dog Show each of the 77 contestants were first given a lead and collar, then had a veterinary check up and were dipped, de-wormed and inoculated before entering the show ring. “We held the show in Lidgetton for the first time this year because we’ve seen the positive difference it has made in the Mpophomeni area. 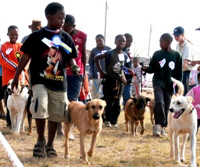 We are trying to reach as many communities as possible,” said uMngeni SPCA’s Adrienne Olivier, the Show Co-ordinator. Sadie won Hill’s Science Plan food and a wooden kennel. Every contestant took home a bag of Hill’s Science Plan food, a lead, collar, bowl and blanket. Pinetown German Shepherd Dog Club gave out Zulu information booklets on dog care, and prizes were sponsored by Animal Talk, Hill’s Pet Nutrition, Howick Cabins, Frontline as well as many other caring organisations and individuals. Vanessa, a mutt from Mpophomeni, wagged her tail with delight when she recently won Best in Show at the third annual Hill’s Township Dog Show in KwaZulu Natal. Organised by the uMngeni SPCA, this dog show with a difference had over 140 entrants. The right dog food is important for a dog's health. Correct food is important for a human's health too. We are what we eat. We are what we think, too. We become what we think about all day long. Jesus said, "My food is to do the will of God, and to finish His work." John chapter 4, 34 If we want to become Christians, we need to think about Christ all day long.